Our Dermal Fillers are a great option for those wanting younger and healthy looking skin. This non-invasive treatment rejuvenates the skin and requires no recovery time. 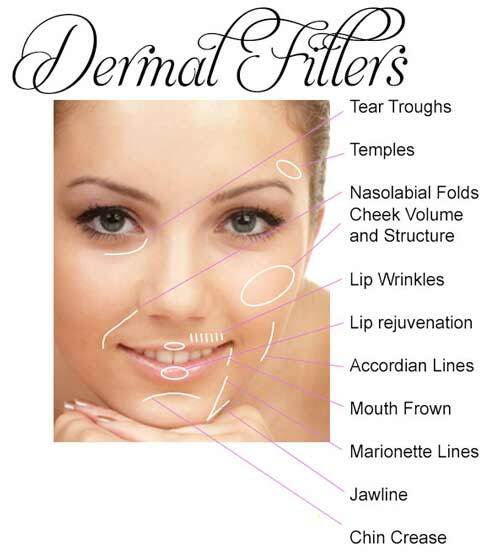 Dermal fillers are a non-surgically enhancement that restores volume to the skin and can be used to re-shape the face. Areas that are able to be treated using dermal fillers injections include; under-eyes, the lips, cheeks, tear troughs, upper eyelids/brows, chin, nose, brows, nasolabial folds, mouth corners and facial wrinkles. We use the latest naturally occurring dermal filler formulation that is comprised of a substance which is found in the skin. Dermal Fillers for the nose can camouflages and eliminates bumps and/or possible irregularities on the nose. Hollows can be filled in for straightening the nose. It will not make the nose smaller in size, but it can hide bumps located on the bridge of the nose. Pressed and dark areas under the eyes can make you look tired, even if you feel full of energy. When this area is filled, the light is reflected differently and the area appears less dark and hollow. 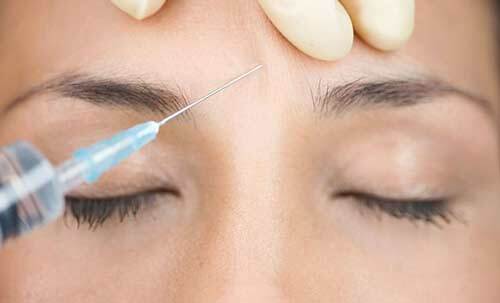 Dermal fillers camouflage dark circles created by the loss of fat in the area under the eyes. If the skin is thin and wrinkled, a small amount of anti-wrinkle treatment may be used in addition to the Dermal Fillers. Giving you less tired and more youthful appearance. The creases that form in the corners of the mouth when you smile and extend upwards, towards the outer edges of the nose are known as the nasolabial folds. These lines can be quite pronounced. Filling these wrinkles with a dermal filler solution will make these creases less pronounced, enhancing the beauty of your natural smile. The pockets of fat evenly distributed on the face give a supple skin and create a smooth contour of the face. However, with age, the fat pockets disappear and hyaluronic acid decreases contributing to slackening skin to the jaw. Using dermal filler injections provide a cheek enhancement can provide an instant face lift. The Injectable fillers increase cheeks and chin volume, eliminating the sunken areas. They can also be used to correct the marionette lines (the folds that extend from the corners of the mouth down the chin). These permanent horizontal creases on the forehead and permanent vertical frown lines can be filled so that the front has a much smoother and more youthful appearance. Sufferers of acne scarring or surgical scars can benefit from dermal fillers as they’ll smooth the texture of your skin and ”fill” the depressions. The Injectable fillers are a great way to increase lip volume. This non-surgically lip augmentation helps recover lost volume that can occur with ageing. Also filling the vertical lines that run up and toward the nose (also known nasolabial folds or as smoker’s lines) can achieve a more aesthetic lips.